At 9 p.m. on November 4, the bright hunter’s moon won’t interfere with observing five beautiful double stars. When the moon is close to full, amateur astronomerstraditionally watch television. That?s because details on the moon are washedout by the high overhead sun, while faint objects in the sky are washed out bythe bright moonlight. The dedicated astronomer finds opportunities where otherssee disadvantages. 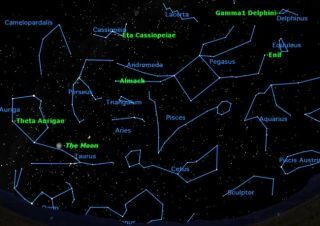 If all we can see are a few of the brightest stars, let?slook at some of those stars. Remember the scene in the first "Star Wars" moviewhere the young Luke Skywalker stands in front of a settingdouble sun? Such double stars are extremely common in the universe, andmake wonderful observing targets in even the smallest telescopes. Let?s start with a very wide double star, so wide that youcan split it with binoculars. Enif is the brightest star in Pegasus, but itisn?t part of the Great Square of Pegasus. If the Square makes up Pegasus? wings, Enif is the wingedhorse?s nose, almost half way from the Square to the bright star Altair inAquila. The two components of Enif are of very different magnitude, 2.4 and8.4, but are more than 2 minutes of arc apart, or almost one tenth of thediameter of the moon. They are too close together to split with the naked eye,but easy to see in any binocular. The 8th magnitude companionappears as a tiny speck just to the right of bright Enif. Delphinus is a small constellation which hovers on theborder between the summer constellations, like Cygnus and Aquila, and theautumn constellations, like Pegasus and Andromeda. In fact, it?s about half waybetween Enif and Altair, and fits perfectly in the field of a 7x50 or 10x50binocular. It?s rare among constellations in that it actually looks like itsnamesake: a pretty little dolphin. Find the dolphin, and then take a close lookat Gamma, the star in its nose. Just about any telescope will show this to be apretty double star, two stars of almost equal brightness separated by about 10seconds of arc. A magnification of about 100x should be just right for thisstar. Cassiopeia is one of the best known circumpolarconstellations, located just across the north celestial pole from the BigDipper. Its five brightest stars form the familiar ?W? shape, and the star weare looking for, Eta, is just above the right downward point of the ?W,? partof the way towards the central upward point. This pair is rather unequal inbrightness, 3.4 and 7.5 magnitude, and separated by 13 seconds of arc. Again100x in any telescope should split it. The three brightest stars of Andromeda form a chainstretching from one corner of the Square of Pegasus in the direction of Perseus:Alpheratz (Alpha), Mirach (Beta), and Almach (Gamma). It?s this last star,Almach, which is the double star. Again, the two components are separated by 10seconds of arc, and are of somewhat unequal brightness, 2.3 and 5.5 magnitude.This is one of the prettiest double stars in the entire sky. The final double, Theta Aurigae, is more of a challenge.Although it?s easy to find, as part of the bright pentagon of stars that makeup Auriga, the Charioteer, it?s two stars are of different brightness, 2.6 and7.1 magnitude, and rather closer than the other stars so far, slightly lessthan 4 seconds of arc apart. If you can?t spilt them at 100x, try a highermagnification. If you find these double stars intriguing, you might wantto observe more double stars on the list from which they come, the 100 doublestars of the Astronomical League?s Double StarClub.